The B4VM-X Series of air handlers, when combined with our 2-stage heat pump or 2-stage air conditioner, offers a full line of quality, split system heating and cooling equipment. Increased Efficiencies-Air conditioning and heat pump efficiencies up to 16 SEER and 8.5 HSPF. ECM Variable Speed Motor - Programmed to provide 12 field-selectable cooling airflows and 4 heating airflows to match any application. Quiet Blower Operation - Extra quiet and smooth blower on and off cycles. Constant airflow - Motor automatically adjusts to different static loads. Selectable delay profiles - Increases efficiency and comfort. Reduced air stratification - This results in improved air quality by optimizing humidity removal and filtration capabilities. Multi-poised - Can be used in horizontal, Upflow, Downflow and vertical applications. Built in Filter Rack - makes the air handler easy to service. Plug-in Heater Kits - Available in 5 kw through 30 kw (Not for use in 115 Volt units) Incorporating blower time delay relay, low voltage terminal strip, and heat-strip sequencing. 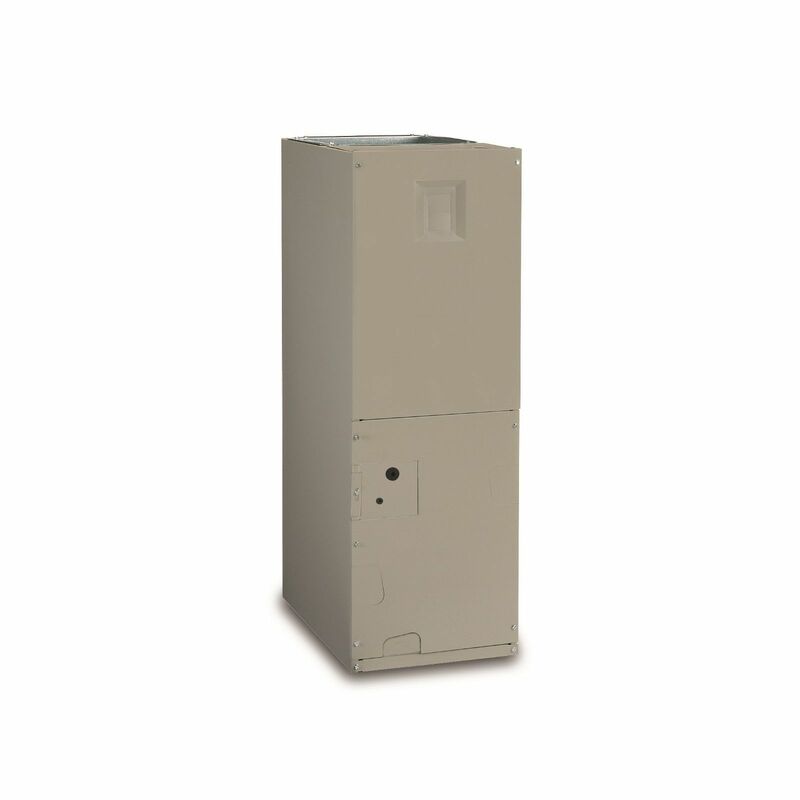 Breaker Accessibility - Breaker accessible from the front of the unit when heater is applied. Plastic Drain Pan - Provides corrosion resistance. Durable Cabinet - Galvanized steel with a polyurethane finish. The finish will endure 950 hours of salt spray and resist corrosion 50% better than comparable units. Cabinet Insulation - 1" insulation with an R-value of 4.2 contributes to quiet operation and prevents cabinet sweating in difficult applications. 2-Stage Cooling - ECM variable speed motor is programmed to operate at 75% of selected CFM when the system is operating in low stage cooling. Thermal Expansion Valve - Factory installed externally equalized thermal expansion valve provides precise refrigerant control under varying load conditions.